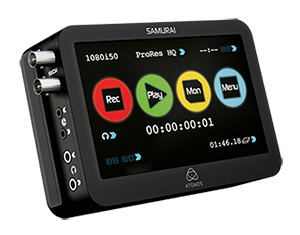 The Samurai is a portable touchscreen-operated HD recorder, monitor and playback device for video professionals. It captures pristine 10-bit 4:2:2 video and audio direct from any camera with HD/SD-SDI output. The Samurai consumes very little power, ensures long recording times (up to 16.5 hours on a 750GB disk) and the efficient use of batteries. The Samurai opens up the efficient and cost-effective world of file-based workflows from an intuitive touchscreen monitor. Capture content in real-time directly from the camera sensor and encode it to Apple ProRes or Avid DNxHD formats, eliminating the lossy, time consuming capture-to-edit process. Bypass the image-degrading compression of in-camera flash storage, and use the limitless and cheap storage of your own removable 2½-inch hard disks. Key features of the Samurai’s AtomOS operating system include record triggering via a start/stop flag or timecode, SmartMonitor focus/exposure monitoring assist (including focus peaking and false colour) and SmartLog for pre-editing (reviewing, marking and tagging) footage. Use Samurai to play directly on-air from a remote location: full quality HD-SDI playback from a deck in the palm of your hand. The Samurai is built from aircraft-grade aluminium. It’s light and can be mounted almost anywhere. All accessories come in a rugged case: batteries, chargers, disk caddies and a PC/Mac docking station. Just add your own HDD or SSD hard disk.